Scientists at the University of Illinois at Chicago engineered a humidity sensor on a bacterial spore. They call it NERD, for Nano-Electro-Robotic Device. 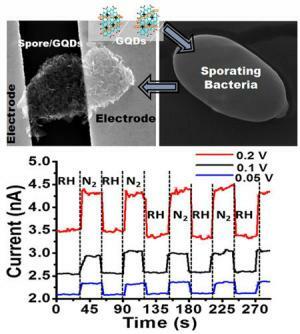 They've taken a spore from a bacteria and put graphene quantum dots on its surface, then attached two electrodes on either side of the spore. Then they change the humidity around the spore,causing the spore to shrink. As it shrinks, the quantum dots come closer together, increasing their conductivity, as measured by the electrodes. The researchers report a very sharp reaction once the humidity is changed, around 10 times faster than a sensor made with the most advanced man-made water-absorbing polymers. There was also better sensitivity in extreme low-pressure, low-humidity situations. The researchers also said it is possible to go all the way down to a vacuum and see a response, which is important in applications where humidity must be kept low,like preventing corrosion or food spoilage and space applications, where any change in humidity could signal a leak. The device is unique in that it involves a biological entity with electromechanical parts. The sensor is designed on the surface of these spores, with the spore a very active complement to this device. The biological complement is actually working towards responding to stimuli and providing information. In addition, currently available sensors increase in sensitivity as humidity rises but NERD's sensitivity is actually higher at low humidity, according to the scientists.